I love this approach…it will be very helpful in managing projects. I’d like to incorporate, but have run into problems implementing. When I run this macro, I the only task that is labeled is the one selected when I run the macro. None of the predecessors are defined in the “Text1” column. Any thoughts on how to correct? Running 2013 STD, is there a setting controlling what relationships are stored in ActiveTask? T.Text1 = “” Object variable not set (Error 91). I downloaded the original code a second time, no modifications, and same error. Any idea what may have changed in the environment that could cause this? 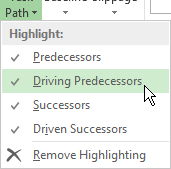 Discovered an important element here – you must have task path highlighting enabled for the properties to return results (i.e. read true). If you don’t enable they always read false. Do you remember what you were doing wrong on from 6/16/2015? Would be helpful to me now. I have cross-dependency in my project. There are around 200 subprojects linked to the master project. In this case, the dependency will appear as a path to the dependent file. I modified your code from ID to unique ID, but still, the code is not working. Can you please help me understand what else needs to be modified to make Task path filter work in Master Project. Got a macro that works perfectly to filter out dependent tasks within a subproject. As I am using this in Master Project dependency will appear as a path to the other file and the macro is not working. Adding to the above query. I also noted that task path filter option in MS Project 2013 is not working in Master Project. It is not highlighting any dependent task but it is working perfectly fine in subproject files. By the way I am using MS Project 2007. I forgot to mention it earlier.